St. Anne’s Church is closed at present to facilitate renovation work and is on course to be opened on time for the 7.00pm Mass on Saturday, August 5th. Painting, decorating, electrical and plumbing work is nearing completion in the main body of the Church and the floor work—which will include sanding and waxing of the floorboards and the laying of a stone carpet on the main aisle and sanctuary, will take place over the coming two weeks. This is delicate work that when complete will require several days without any disturbance. The project will not be completely finished on the 5th of August—just the elements that required the total clearance of the seating from the Church and the use of scaffolding. Work will continue on St. Joseph’s Chapel, the Sacristy, storerooms, the roof and the Parish Centre throughout August. Some minor works will also require completion in the main body of the Church in the weeks after it re-opens. The Annual Blessing of the Graves will take place in St. Anne’s Cemetery on Sunday, September 3rd. Now would be an ideal time to tend the plot of a family member or loved one. The battle against weeds and litter continues every Tuesday. Meet at Market Sq. at 7pm. All welcome. We would appreciate if all Business and home owners in the town and surrounding area would paint their properties, sweep the paths and trim the verges. Thanking you for playing your part in keeping Bailieborough tidy. After a great response the Soccer Academy will be going ahead for children born in 2010 and 2011 starting on Saturday 12th of August from 12.30 to 1.30pm. We will be registering children in advance of the start date to ensure no disruption to the sessions, 10 euro per child, we will provide more information closer to the date. Feel free to contact Keith Burke on 0861631538 or pm the Club’s Facebook page. Pre-season training for our Under 16’s team (players born in 2002) started on Thursday last at 7pm and continues each Thursday until the start of the 2017-2018 season in mid-September. Looking forward to seeing all of last year’s squad as well as any new players interested in being part of the team for the coming season. Pre-season training for our Under 13’s team (players born in 2005) will start on Wednesday 26th July at 7pm and continue each Wednesday until the start of the 2017-2018 season in mid-September. Looking forward to seeing all of last year’s squad as well as any new players interested in being part of the team for the coming season. Senior pre-season training continues on Tuesday and Thursday evenings at 7.30 sharp at the Vale Grounds. For further details, please call or text, 085 825 6347. Saturday 19th August at 4.00pm in Bailieborough Library: “People, place and time” an exhibition of Benny Duffy’s (Nolagh), photographs and memorabilia. Admission Free, Refreshments Served. Exhibition will be on display for the duration of Heritage Week. Saturday 26th August at 8.00pm sharp – Doors 7.30 – Bailieborough Business Centre: “A Wilde Victorian Evening” presented by Patrick Walsh and guest on the life, loves, wit and wisdom of Oscar Wilde. Admission free. Refreshments served. Victorian Dress encouraged. Not suitable for young children. Wednesday, July 26th – Derrygooney / Knappagh: (M) Walk 1.5- 2 hours (approx.) Leaving Bailieborough Library at 6.45pm. Walk commences at Derrygooney School at 7.15pm. From Shercock travel towards Cootehill, at 3.8 kilometres turn right for Ballybay, a further 2 kilometres turn left and continue for a further 2.5 kilometres to the school on the right. August 2nd – Lough Curragh Lake: (A) Walk 2 + Hours. Leaving Bailieborough Library at 6.45 pm. Walk commences at 7.15pm at Lough Curragh Lake. 12km from Bailieborough on Cavan Road. Car park on left just past the lake. All welcome. ‘Reflections’ is a beautiful exhibition of paintings featuring some Cavan landscapes, by Wexford artist, Niki Purcell, which is on show at the Library until Tuesday August 15th. All welcome and admission is free! Computers for Beginners – Computers for Beginners at Bailieborough Business Centre are continuing throughout the summer. Classes are once a week for 2 hours. Come along and enjoy the friendly atmosphere while learning a few new skills. Call 042-969-4716 to reserve a place. Bailieborough School of Music are delighted to announce the date for our 30 year Anniversary Concert; February 25th, 2018, at the Helix Theatre, DCU. Looking forward to the celebrations. Lotto results for 22/07/17. Numbers Drawn; 2, 8, 15, 16. No Jackpot Winner. Luck Dip (€25) Winners; Joe O’Reilly, Chapel Rd; Anthony Barry, Curkish; Samantha Dunne, Hawthorne; Brid Smith, Rakeevan. Jackpot next week, €4,000. Entries to ‘Summer Draw’, Thomas and Georgina Rogers; Cora O’Connor; Colette Curtis; Karl Daly. Well done to the Local Red Cross who installed a very important piece of life saving equipment beside the ‘Carry Out Shop’ on the corner of Bailieborough Main Street and the Shercock Road over the weekend. Defibrillators are so important in every area. They can be the difference between life and death. We never know when someone in our community will need one. Please respect this vital piece of life saving equipment. The Annual Blessing of the Graves will take place in Moybologue Cemeteries (Old and New) on Sunday, 20th August 2017 after 10am Mass in St. Patrick’s, Tierworker. The following are the available dates for Baptisms in St. Anne’s Church–July 30th (Sunday, 12.30pm), August 12th (Saturday, 1.30pm), August 20th (Sunday, 12.30pm), September 2nd (Saturday, 1.30pm) and September 10th (Sunday, 12.30pm). Everyday Irish – Tuesday evenings 3pm. to 5pm. Thanks to everyone who volunteered on Saturday last in Bailieborough Tesco for our bag pack. Thanks to the staff and management of Tesco and to their customers who were so generous towards local hurling. 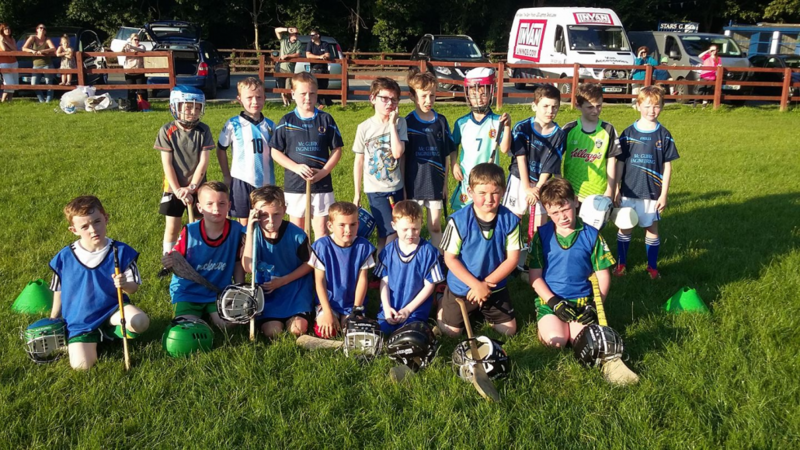 A good workout for our U8s & U10s last Monday in a sunny Kingscourt v Carrick. Thanks to Kingscourt Stars for the use of their facilities and to Carrick for coming over. Our next games will be in early August. Above; Mondays U8s with Carrick. The U12s have the final regular round of the league away to Clontibret on Monday at 7.30. The Monaghan under 14 League final take place on Sunday next at midday in Castleblayney against Castleblayney. This is our first final since the move to Monaghan so the very best of luck to all. Under 16; the lads were well beaten on the 3G at Breffni by Lisbellaw in the league on Monday last. Stripped of a significant number of regulars due to football commitments it made for a tough evenings work. Thanks to our lads for their efforts. The first round of Ulster U16 on Saturday last also fell victim to a clash with football but we hope to be up and running for the next round. Minor; the minors will begin their campaign in mid-August in the South Ulster league. All training at BCS pitch Wednesday 7pm. Players will receive a text. For all info on these age groups then please contact Kathryn 087 244 1371. Wednesday; U14/16/18 training at BCS pitch 7pm. Friday; U14 training BCS pitch 7pm. Sunday; Monaghan U14 league final in Castleblayney at 12. Midweek updates on our Facebook page- East Cavan Gaels Hurling. The Bailieborough Cancer Comfort Ltd Committee is available to help cancer patients or their families. Free Taxi service available. For further information contact: Michael Cullen 087 154 2447 or Edel Fox 086 1004030.
http://bailieborough.com/wp-content/uploads/2015/09/bborocomlogo2015-300x130.png 0 0 Lee McDonnell http://bailieborough.com/wp-content/uploads/2015/09/bborocomlogo2015-300x130.png Lee McDonnell2017-07-27 15:04:372017-07-27 15:04:37Bailieborough News. July 24th 2017 Matthew J. Cullen.